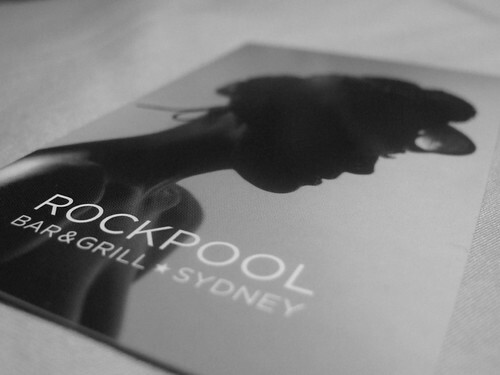 After a little whine to the boyfriend about never going out to dine at anywhere new, he surprised me with a “just because” dinner at Rockpool Bar & Grill. 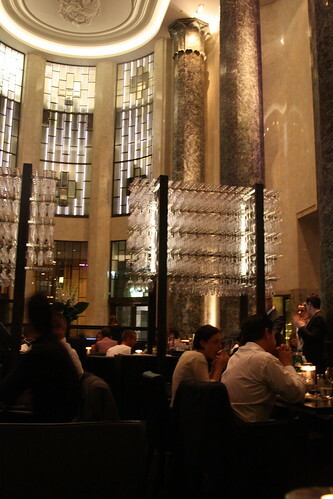 Pushing through a pair of strong glass doors, enter into a gorgeous room with a sky high ceiling, dim lights, marble and a beautiful wine glass centerpiece. The dining room is a mixed bag, filled with couples on dates, business men doing final deals and seated next to us, an old married couple on their date night. 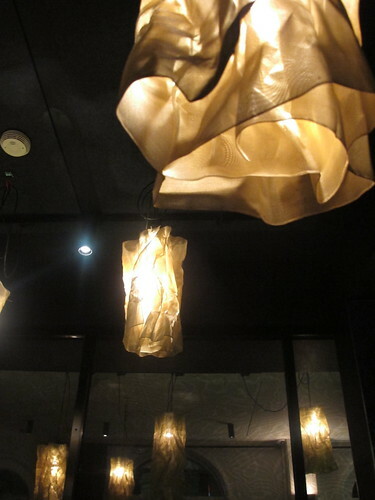 The menu is extensive, and my eyes are barely keep up as they zip through left right and centre; with offerings from the cold bar, salads, hot entrees, pasta and meats from the grill. 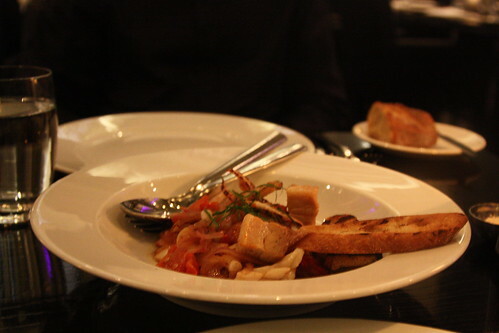 And every day, there are slight alterations to the menu to keep up with the produce in season, so the our shared entree is sometimes on and off their menu. 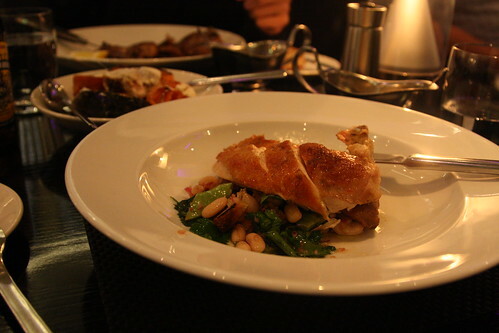 For some strange reason, I played it really safe and chose the chicken cooked on the wood fired rotisserie, served with a Tuscan white bean, tomato and bread salad – and unfortunately being safe didn’t pay off as I salivated over my companion’s lamb cutlets all night. The chicken had the perfect crust with on a light and tangy salad but there wasn’t anything that pushed the dish over the edge. The lamb cutlets and chops were amazing – served with a mint jelly on the side, the lamb was tender and juicy, and probably the best lamb I have ever had. Busting at the seams, I was told I was not allowed to go home without picking a dessert – and for once, I’m happy I didn’t argue back and nodded in agreement. 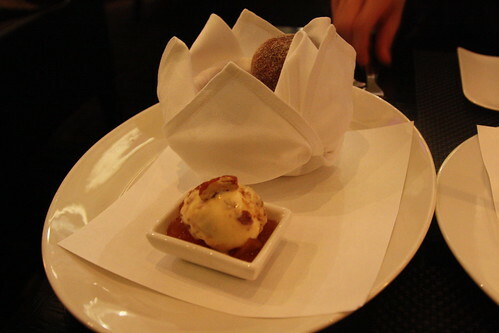 Sharing some good ol’ doughnuts, which shouldn’t be dismissed off the menu straight away as they were surprisingly heavenly; warm, light and soft and wonderfully contrasted with cold ice cream. 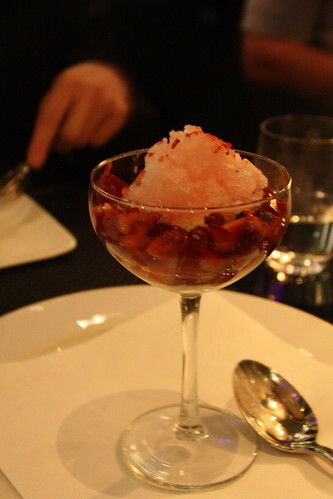 My highlight of the night alongside the lamb, is the vanilla panna cotta served with beautifully sweet fresh and dehydrated strawberries with a sweet smelling rose granita. So incredibly good. So it’s the birthday my best friend, holiday buddy, dessert-brunch-anytime food loving companion, so I couldn’t think of a sweeter treat than a dessert degustation. After reading, or rather salivating over the recent circulation of reviews of Bentley Bar, I thought it was overdue for our turn. 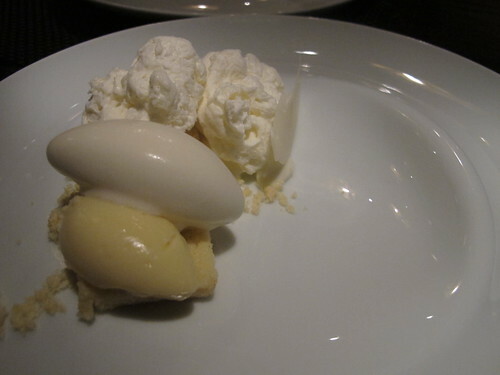 Second on the menu is the milk cake was served with magnolia ice cream and white chocolate – a dish with an amazing number of different textures from spongey, ice creamy, crumbley and airy. 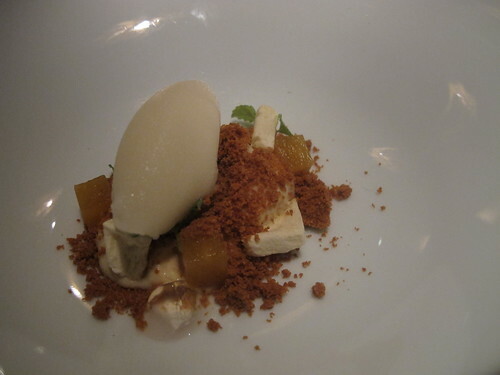 The magnolia ice cream was my favourite component on the dish with its amazing floral scent. The third dish is the beetroot sponge, confusing my mind and tastebuds, but afterall that is the wonder and mystery of molecular gastronomy. 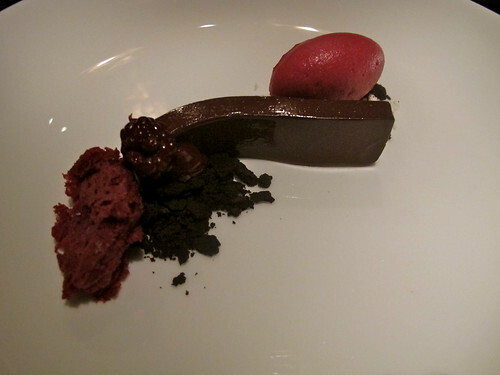 The beetroot sponge was served with a dark chocolate custard, sour blackberries, chocolate soil and beetroot sorbet. And although I prefer my beetroot in my hamburgers, I didn’t mind too much of the beetroot sponge cake; it was light and airy, with subtle beetroot flavours. The chocolate was absolutely spot on! 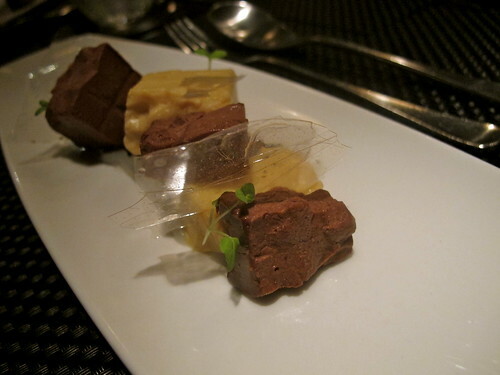 The final art on a plate is the toast custard served on a bed of lychee puree and chocolate parfait. Being a chocolate junkie, of course I enjoyed the chocolate parfait, but there was something really mind boggling about the toast custard, which involves sourdough bread toasted until dark and infused with the custard. And amidst the creaminess of the parfait, crunchiness was added from the see-through film shards of lychee sweetness added the perfect crunch. Interesting flavours showing that desserts can be savoury or sweet. 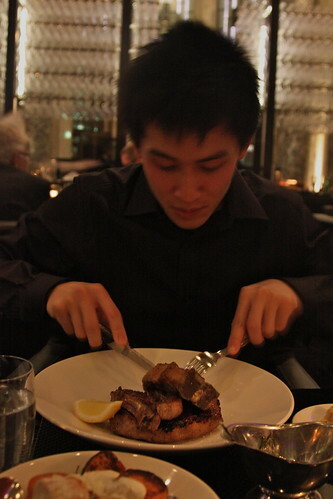 Would love to do this again so my fingers are crossed that the menu keeps changing! There’s been a lot of hype and chatter about this place, so after an afternoon at the Oh Really! Gallery, it was a shot to see whether we could score a table. Luckily enough we did, even though it meant being seated downstairs in the dungeon so there was a little loss of ambience..
All the dishes are designed to share, so after contributions around the table – we settle with some fried bean curd rolls, crispy chicken wings and the much FourSquare promoted polenta chips with gorgonzola. The fried bean curd rolls were a favourite and resembled a fried dim sim with a crispy outer and a meaty ball of crab, pork and shitake mushroom on the inside. The not so favourite were the chicken wings with yoghurt remoulade, and the hyped up polenta chips, but I was told I was being a minimalist with the gorgonzola sauce. The mains roll out and the smell is amazing. 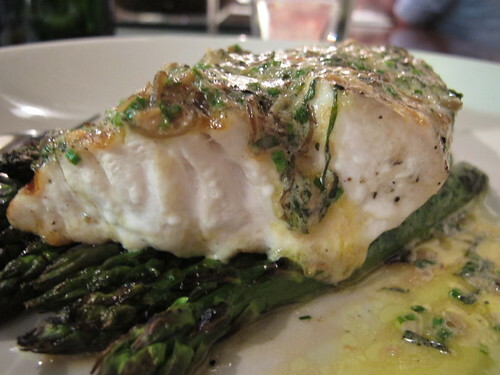 The fish special of the day included a poached fish (sadly I am absolutely horrendous at remembering and identifying fish types) that was flavoured with miso and eel sitting on a bed or asparagus. 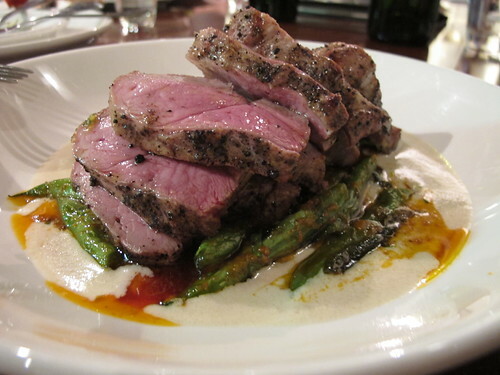 Another drool worthy main is the grilled milk fed lamb served with a black bean puree, fennel and green beans – tender and juicy, and perfectly grilled. 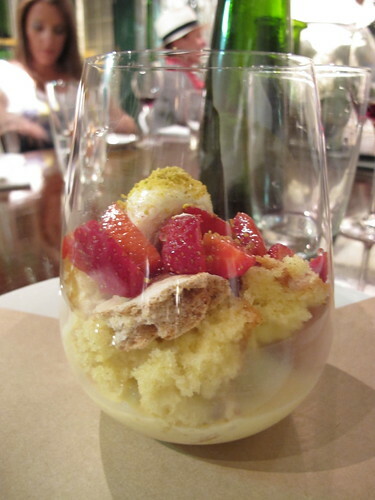 But right before the get-go of selecting savouries, I had my eyes set on the Bloodwood trifle – served in a tall glass, it’s filled with fresh sweet strawberries, pound cake, mascarpone and champagne jelly. And indeed it was the perfect dessert it was to finish the evening. 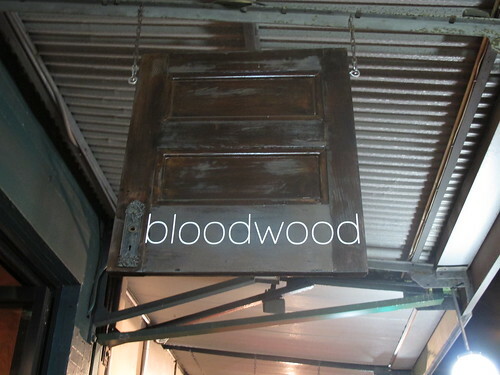 Nice bar with potential as they’re exploring different flavours and going beyond the square. If they keep heading in the direction with what their mains are at, it’s going to be a continued hit.